“School ceasefire”. The “school ceasefire”, which began on August 25, has been finally disrupted. Pro-Russian militants resumed the use of Minsk-proscribed weapons. 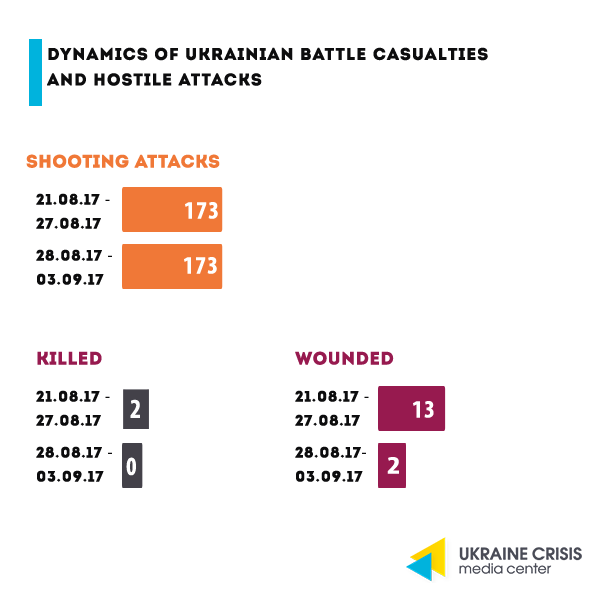 On September 3, they used heavy weapons against Ukrainian military in Mariupol and Donetsk sectors. 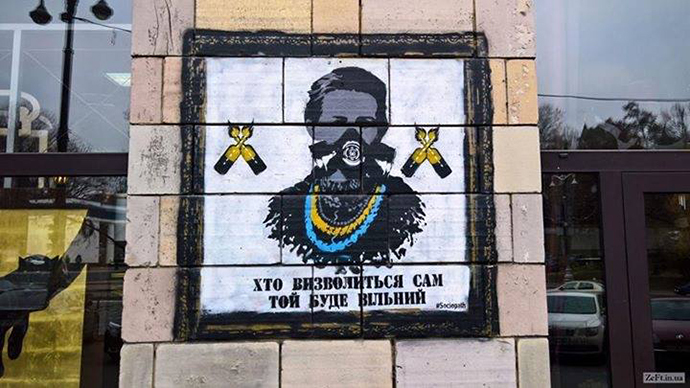 At the same time, Ukrainian servicemen are strictly forbidden to open fire. Each case involves an official investigation and bringing to responsibility. OSCE. Alexander Hug, Deputy Chief Monitor of the OSCE Special Monitoring Mission to Ukraine, said that they had recorded over 600 ceasefire violations since “school ceasefire” was announced in Donbas. Separatists’ hostages and abduction of civilians. On August 31, pro-Russian militants kidnapped a young man who was working part-time as a heaver at Stanytsia Luhanska checkpoint. A week ago, at the same checkpoint, militants kidnapped another guy who was also a loader. Subsequently, the young man’s body was found in occupied Luhansk with traces of violent death. Advisor to the SBU head Yuriy Tandit said that 144 Ukrainians were militants’ hostages as of September 2. Russians in Donbas. New InformNapalm investigation. A number of Russian private military companies operated in the territory of Ukraine in Donbas and Crimea. They could operate under the control of the Kremlin, according to the InformNapalm investigation. Over 400 persons disappeared in the occupied territory of Donbas. According to the Ministry of Foreign Affairs of Ukraine, over 400 people are now considered missing in the ATO zone. Restricted access of international humanitarian organizations to the territory of the occupied districts of Donetsk and Luhansk regions makes their detection impossible. Over 1,000 applicants from uncontrolled Donbas entered Ukrainian universities. According to the Ministry of Education and Science of Ukraine, as of August 23, over 1,000 applicants from uncontrolled parts of Donetsk and Luhansk regions and about 150 applicants from the annexed Crimea became students of Ukrainian higher education institutions. Prohibitions to communicate with the OSCE. According to the OSCE report, “DPR” and “LPR” militants prohibit teachers in the uncontrolled territory to communicate with the OSCE monitors. The EU-Ukraine Association Agreement has fully come into force on September 1. The economic part of the Agreement, concerning the Free Trade Area between Ukraine and the European Union, has been in operation for over a year and a half. Now, the EU has become Ukraine’s main trading partner. Currently, trade with EU countries comprises 41.1% of Ukraine’s total foreign trade. In the first half of 2017, exports of goods and services to the EU grew by 22.8% compared to the same period in 2016 and amounted to $9.4 billion. European Commission President Jean-Claude Juncker said that the day when the EU-Ukraine Association Agreement fully came into force was a holiday for the whole European continent. 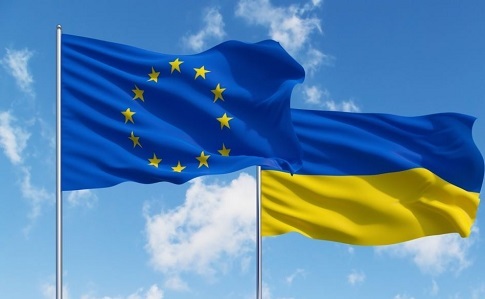 High Representative of the EU for Foreign Affairs and Security Federica Mogherini stated on that day that the Ukrainian people can count on the support and cooperation with the European Union for years to come. President of Ukraine Petro Poroshenko issued the Decree on introducing biometric control for foreign citizens, in particular, citizens of the Russian Federation entering Ukraine effective since 2018. According to the document, the government has been instructed, within a month’s time, to improve the legislation on the procedure for staying in Ukraine for foreigners, in particular, citizens of the Russian Federation. President of Ukraine Petro Poroshenko considers the decision to introduce biometric control for Russian citizens entering Ukraine absolutely justified. 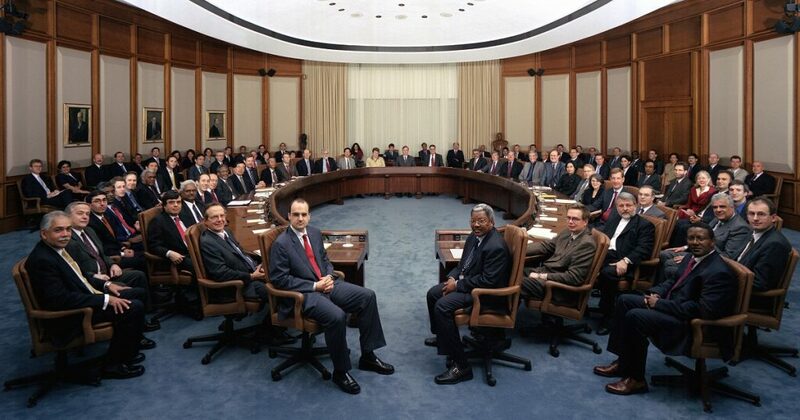 He noted that the decision of the National Security and Defense Council will be made public in the coming hours. “From January 1, 2018, border crossing by citizens from the countries that pose risks to Ukraine (the list of these countries is approved by the Cabinet of Ministers of Ukraine) must take place upon biometric passports and for those who do not have them – there should be the registration of biometric data on the border. This does not mean there will be a ban, but border checkpoints should be equipped with the appropriate equipment and this will ensure proper registration,” Poroshenko said. In September- October , three IMF missions will arrive in Ukraine. Among the issues that the IMF mission intends to study are the draft budget for 2018, pension reform, etc. The first mission will begin on Monday, September 4, another one is scheduled for September 14. Although the National Bank of Ukraine (NBU) and the Ministry of Finance assure that until the end of the year Ukraine expects to receive IMF tranches, some representatives of these bodies are not so optimistic. “We do not understand whether there will be a tranche this year. Besides, the mission will be working in the conditions when there is no new head in the NBU and the Minister of Finance may be suspended from his duties,” says a source in the NBU. According to the survey conducted by the Institute of Sociology of the National Academy of Sciences of Ukraine in cooperation with the Intellectual Perspective Foundation, the overwhelming majority of the population of Ukraine (about 63%) is proud to be citizens of Ukraine. Moreover, this percentage has increased significantly since 2014 (in 2013, 48% of respondents were proud of the citizenship of Ukraine, in 2014 – 60%, in 2015 – 67%, in 2016 – 60%, in 2017 – 63%). In 2017, the main feelings that people have when they think about Ukraine’s future are hope (47%), anxiety (35%), optimism (21%) and fear (17%). The following economic fears prevail in 2017: price growth (77%), unemployment (61%), non-payment of wages and pensions (63%). Among the biggest fears are the increase in crime (43%), the attack of an external enemy (38%). The famous patriotic graffiti Icons of the Revolution disappeared from the facade of the luxury furniture store “Emporium” at Hrushevskyi Street, 4, in Kyiv. Store director Ihor Dotsenko called these graffiti “just typical street art that is regularly removed by the city utilities.” Later, protesters destroyed the porch and started burning tires near the store. 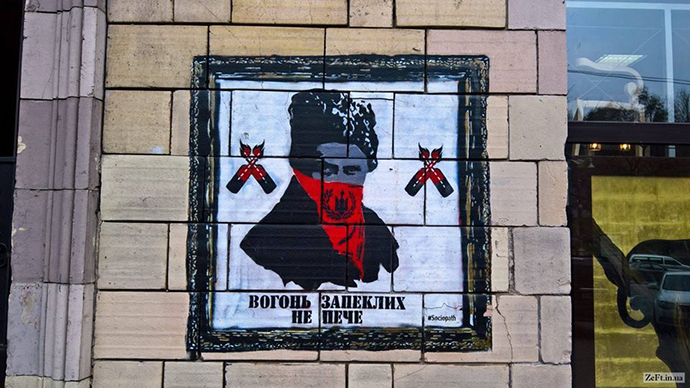 The Kyiv Prosecutor’s Office initiated a criminal investigation into the graffiti destruction case, because they are objects of cultural heritage protected by the law. Prosecutor General Yuriy Lutsenko said that all state control bodies will check business of the store entrepreneurs. The store was closed by the end of the day. 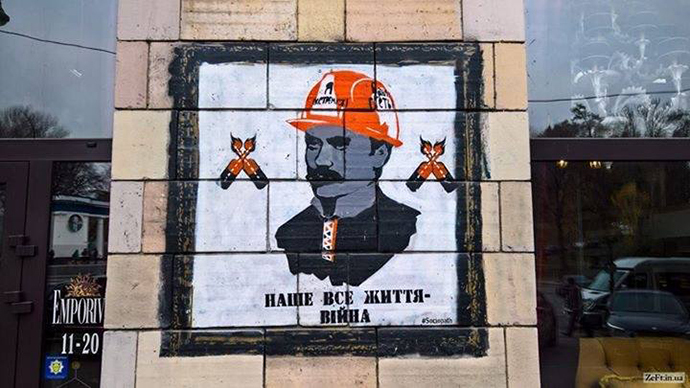 Kyiv artists are planning to restore the destroyed graffiti. 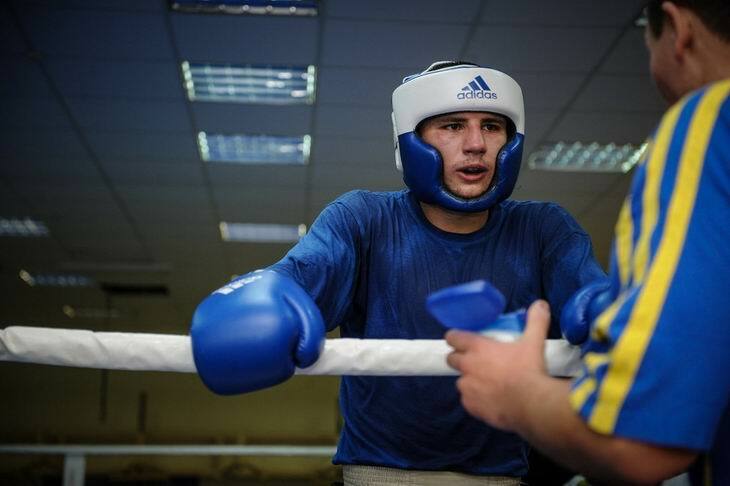 Ukrainian Oleksandr Khyzhniak defeated Abilkhan Amankul (Kazakhstan) in the final fight for the world boxing champion title in the middleweight competition at the World Boxing Championship in Hamburg (Germany). Our athlete was awarded a victory by a 5:0 unanimous vote by side referees after the boxers had a full fight. Notably, the Ukrainian boxer enjoyed an overwhelming advantage, falling short just a couple of seconds from knocking down his opponent as early as the second round.